Schroter’s Valley, frequently known by the Latinized name Vallis Schröteri, is a sinuous valley or rille on the surface of the near side of the Moon. It is located on a rise of continental ground, sometimes called the Aristarchus plateau, that is surrounded by the Oceanus Procellarum to the south and west and the Mare Imbrium to the northwest. 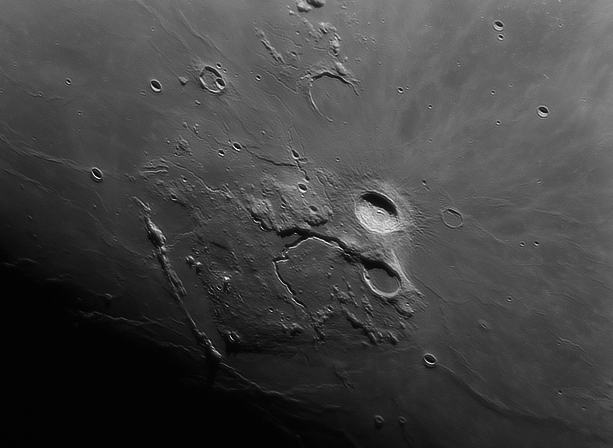 At the southern edge of this rise are the craters Aristarchus and Herodotus. This is the largest sinuous rille on the Moon. It begins at a 6 km diameter crater located 25 km to the north of Herodotus. (The start of the rille has been termed the “Cobra’s Head” by some observers, due to its resemblance to a snake.) From the crater it follows a meandering path, first to the north, then setting a course toward the northeast, before finally bending back to the south until it reaches a 1 km high precipice at the edge of the Oceanus Procellarum. The rille has a maximum width of about 10 km, then gradually narrows to less than a kilometer near its terminus.